I've recently acquired a very nice example of this, and would be interested to add sound to it. However when I consulted a knowledgeable local retailer who also has his own railway, he said that there isn't space for a decent size speaker, so the result when he tried it was quite weak sound. Has anybody fitted sound to this one and been satisfied with the result ? Could you tell me more? 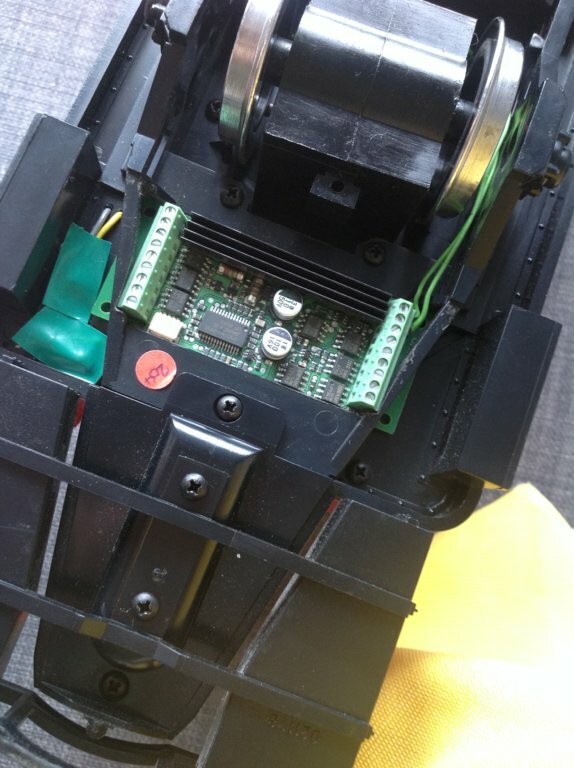 Which sound module and where was it mounted? There are many ways of doing sound in these RC's. 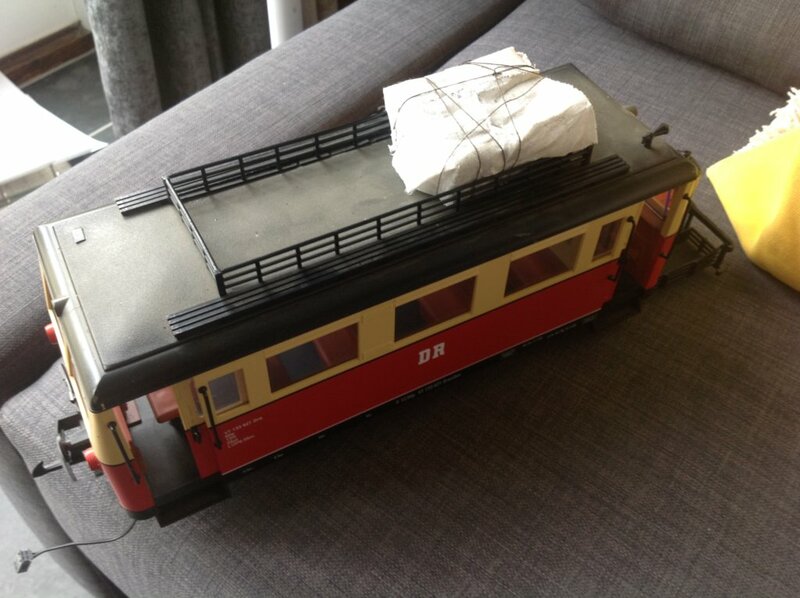 I have mounted the LGB Diesel Sound Box in the Cab and on the Roof hidden under a Tarpaulin on the Roof Rack. Wires taken via a Black Straw to hide them. I have also used a Massoth Sound Decoder, they do it with the correct Sound. I also hid this on the roof in the same way. In all cases the sound is very good, quite possibly your Dealer man might have hidden the Speaker somewhere where the Sound was subued by the Bodywork. Thanks for your reply. 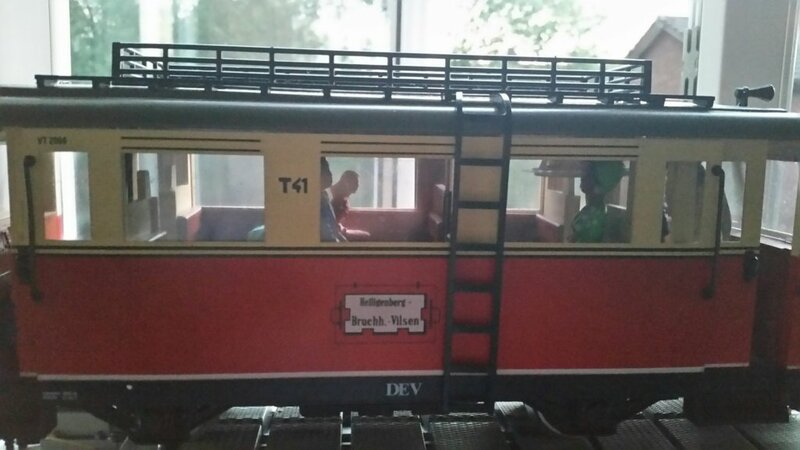 Apologies in advance if I am wrong (and I remain in awe of the knowledge of you regulars on here) , but are your solutions in relation to the 2066 model of the older railcar? The 2064 does not have a roof rack. On the other hand if you installed it in the cab, that ought to be possible on the 2064 too, since they look a similar size. Have only had a brief correspondence with my guy by email, i will go to visit him next month, (he is not in Prague). But if I understand him correctly he felt constrained to use a smaller size speaker because of the lack of space for a decent sized one. I have never looked at retrofitting sound before, so I have no idea what the options are. The other thing I should mention for anyone with advice is that my solution needs to be analogue. I have recently had two 2064s fitted with a Dietz sound decoder.The work was carried out by Joachim Dietz himself in Germany. I can thoroughly recommend this as a viable option. Dietz sound decoders are well thought of. While I agree that the little Dietz sound modules are excellent (and relatively inexpensive), they do require a DCC decoder with a SUSI port, and even then I don't think they work on analogue DC. The best solution for analogue sound is, In my opinion, a Massoth "S" module loaded with the correct sounds for the 'bus, this will work just fine on analogue with just two connections to track power (white and brown wires) and the module itself is small enough that it can be installed in the roof area, beside the strip of PCB that carries the internal lights. If you use one of the little 25mm diameter speakers, this should also fit in the roof pointing down into the body of the bus, and you should be able to get a reasonable volume out of this set-up. TOP TIP there's not a lot of room under the chassis go to £ shop and buy a telephone ext kit you will get yards of thin wire ideal for this. 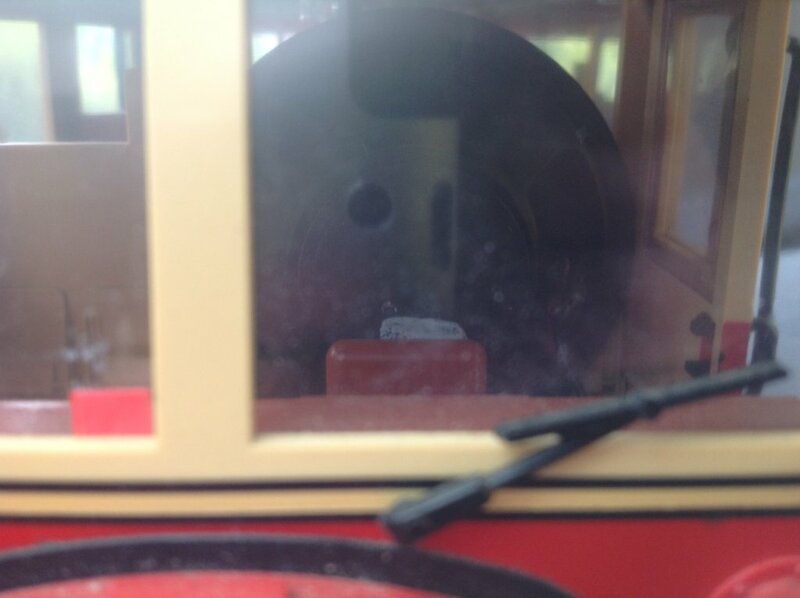 That's a nice installation in your pignose, Frank - had to look for a moment before I saw the speaker, is it very visible inside the bus at normal viewing distances/angles? 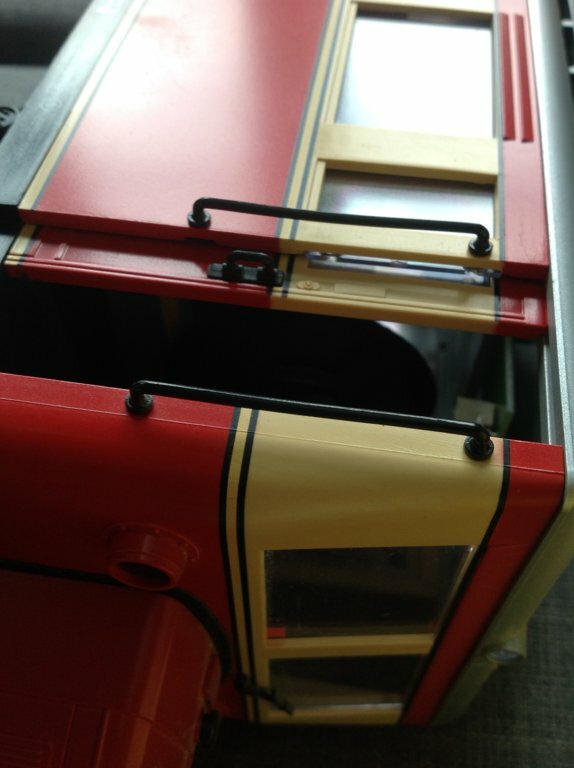 Sorry not replied earlier, been off helping a friend with his Garden Railway Extensions for a few days. None of my current conversions are oldies but my 3 car Red Only might be a 2064 but it is in the loft! I do have a couple of oldies to do one may be a 2065 none of these have the Roof Racks. But a rack could be made as a Box out of Plasticard to put Chip In. Some of my Conversions. Below Dentz Chip mounted underneath with Speaker in the Cab not the LGB Box as I said. Below Massoth Pig Nose Sound Chip with Speaker and Luggage mounted on Roof. Covered with a Paper Roof Tarpaulin held down with Cotton. Below LGB Sound Box on Roof covered with some kind of Material and held down with Cotton again. This is one half of my Twin Unit, Cable connects into LGB Cable Receptor rewired to pass Current between both units. Each car has one of these so 4 Wires pass between Cars. Must dig out Tripple from the Loft to see what I did with that. Just thought I would reactivate this, in case anyone has any new ideas. I am in the process of going digital, so this will need a decoder now. Installing is beyond me by some way, but my dealer is also an enthusiast and happy to do the work. However as mentioned previously, he says this is far more complicated than with most models. I have not quite got to the bottom of why. 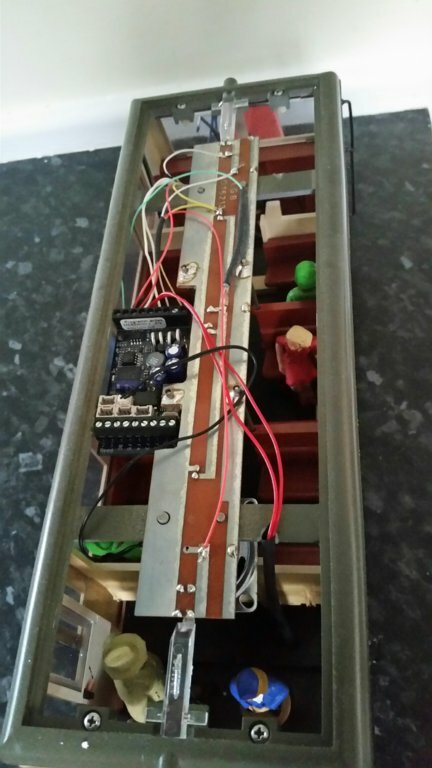 He sent me a link to this article (in Czech, but maybe some of you will at least work out from the photos how the guy has done it) which he says he used on a similar model, but I note that it is not a 2064. Although I suppose dunnyrail 's model is basically the same thing. He says it is do-able, just it will take him at least twice as long as e.g. my Stainz's. Just asking once again for any tips to pass on to him to make it easier. One thing - I am not too bothered if the sound volume isn't so high, I plan to keep the levels modest. Thanks.. I have Chipped up some of the older Railcars and to the best of my memory it was not as difficult as any of the older Clamshel Type of motors, these had a Common return vis the Pickups. I do not think this applies with the older 2064 Railcars. So the only issues are where to run the wires and where to put the Decoder. 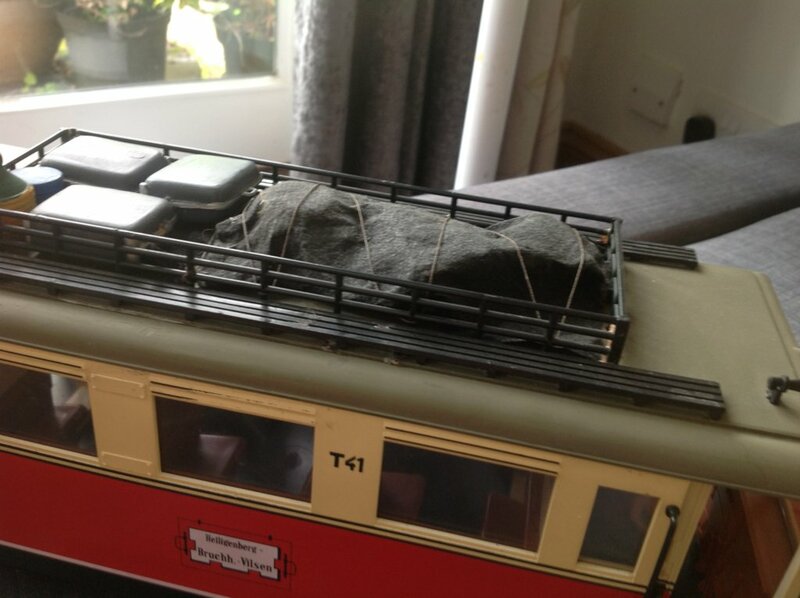 Either in a roof Load like mine or as I have done in another conversion aqueeze it into the Cab and hide it in a Plasticard Box. I use Black Straw to hide Wires when I did the roof mounted chip and speaker. I also did a bit of modification on the older 2064 to the Roof Wiring Circuits to get lights working from the chip rather than relying on direction which involves a Common Return, again not suitable for a DCC Chip if you want lights. Your man is probably right in saying that they are not a standard job, but with a little thought and care not tricky. Here is a link to the LGB Breakdown Diagram. Anything is possible.. Whether the OP would think the cost of the persons time to do this is 'acceptable' is another matter?? We have all done jobs which have taken far longer then they really should.. Very satisfying, but not viable financially. I've spent 9 hours on an install, where the speaker was tricky, and the wiring from the factory has had issues, and most of the wires were too short, etc. So, his estimate is not unbelievable.